DISCOVER: How to Use The 7 VITAL KEYS That Will Transform Your Life Forever. Want to improve your life, but don’t know where to start? Right now you could easily use any of the 7 keys to instantly change how you think and how you feel. You see, your dominant thoughts and emotions create the circumstances of your life. And its very easy to change your internal programming and what happens to you, when you know how. The 7 keys can enable you to achieve everything you yearn for in life, allowing you to become deeply happy and fulfilled and outrageously successful. 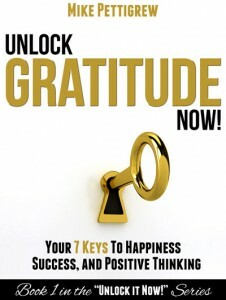 Unlock Gratitude Now! details a step by step system for transforming your life. The best part? It can be done both quickly and easily using each of the 7 Keys. You can easily change your life, become successful and deeply happy! Just follow this blueprint and you’ll learn a proven system for self-transformation, empowerment, success and happiness. I have gone from rags-to-riches twice during my life and I know exactly what dominating thoughts, feelings and actions lead to both failure and success. I was inspired to write this book as I felt that my own experiences of success and failure could help a lot of people overcome their own difficult circumstances. This is a practical book designed to give accurate, simple instructions that will enable you to become happier and more empowered and to achieve all the things that you yearn for in your life. If you have ever tried and failed, or experienced significant loss then this book can help you to become empowered and achieve your goals. If you find it difficult to overcome negative thoughts, or if life has become stale and lost its vigour, then this book can help you to become more positive and bring back the sparkle into your life. If you have tried all sorts of things to get your life moving in the right direction and have become disillusioned because they didn’t work, then this book can show you the simplest and most effective route to empowerment and success. Hi, my name is Mike Pettigrew and I’ve gone from rags to riches twice during my life, and I have discovered that our dominant thoughts and emotions always lead us to our successes and failures. I have also learned exactly what to do to ensure that we can become successful, happy and empowered instead of being dominated by loss, disempowerment and fear. This book will help you no matter what religion, belief system or philosophy you may practice. Whether you are religious, spiritual, or just don’t know the difference; providing you follow the simple instructions given in this book, you will discover an immense creative power within you that may have been lying dormant until now. When you learn how to activate this great power, and use it in very definite ways you may be astounded at how your life can start to unfold. You will discover that success and fulfilment is created by your mind and you will find out exactly how you can use your mind to create all that you desire.